Three legal scholars assess the impact of Obama's nomination of Federal Judge Sonia Sotomayor to the US Supreme Court. Editor’s Note: In a forum published in the May 25 edition of The Nation, three legal scholars discussed Federal Judge Sonia Sotomayor’s judicial style and potential impact on the US Supreme Court. (John H. Boalt Professor of Law, University of California, Berkeley): Many scoff at the clamor for President Obama to nominate a woman to the Supreme Court or a minority or someone from a non-elite background. They dismiss in particular the enthusiasm of ostensible identity commissars who seem to support Judge Sonia Sotomayor, the daughter of working-class Puerto Ricans, as the triple threat of identity candidates. Yet identity does matter–if indirectly. Yes, the judicial apotheosis of someone affiliated with disfavored groups would help repudiate negative stereotypes (it turns out, Latinas can do more than clean houses). True, such ascension would add to the law’s legitimacy (further burnishing the belief in the Americano Dream). All fair enough. But at stake is a seat on the Supreme Court; far and away the most important criterion for selecting among various technically superb candidates must be intellectual and moral vision. Which is the key reason identity matters. The central point is not to provide diverse role models, and it’s certainly not to maximize differences of every stripe. The essential thrust of identity politics is to accord special consideration to race, gender and class (plus sexual orientation and disability)–because these constitute core, persistent, unjust hierarchies. Biography is not intellectual destiny; group membership is not epistemological fate. Nevertheless, ties to the central marginalized identities in American life surely encourage sustained engagement with inequality. Judge Sotomayor deserves our support not because of who she is but because of what she thinks–especially about the most injurious forms of structural injustice in the United States: race, gender and class. (dean, University of California, Davis, School of Law): After hours of mental gymnastics, I simply could not narrow the field to a single “ideal” Supreme Court nominee. But I offer two potential nominees who would make us all proud and reflect the life experiences, as well as the commitment to the rule of law, of President Obama. Both are highly intelligent and well qualified. Both have varied legal careers that offer the breadth of real-life knowledge that we need in a Supreme Court justice. Both made the most of humble beginnings. Both would add valuable perspective and insight to the Court. A product of the Bronx housing projects, Judge Sonia Sotomayor became the first Puerto Rican woman to serve as a US Circuit Court judge. A graduate of Princeton and Yale Law School, Judge Sotomayor began her career as an assistant district attorney and later joined a small civil law firm in New York City. She served as a federal district court judge before being elevated to the US Court of Appeals for the Second Circuit. Judge Sotomayor would be the first Latina (or Latino, for that matter) on the Supreme Court. Besides representing the inclusion and full membership of Latinos in American society, her appointment would add a perspective on issues such as language regulation, immigration (including state and local efforts to regulate immigration) and education, different from that provided by any previous justice. An experienced federal judge, Judge Sotomayor has the scholarly credentials and professional experience to make an immediate contribution to the Court. Massachusetts Governor Deval Patrick was born and raised on the South Side of Chicago. The first in his family to attend college, Patrick graduated from Harvard College and Harvard Law School. (Full disclosure: I knew a young Patrick, who was in the class ahead of me, in law school.) Patrick served as a law clerk to a US Circuit Judge Stephen Reinhardt before joining the NAACP Legal Defense and Education Fund. He next worked in private practice until confirmed as the assistant attorney general for civil rights in the Justice Department. Patrick later served as general counsel of Texaco and Coca-Cola before being elected governor. For the past twenty years, the Patrick family has lived in Milton, Massachusetts, in a house that was on Deval’s paper route as a teen. A highly accomplished and intelligent lawyer known for his coalition-building skills, Patrick’s appointment to the Court would represent the first time that two African-American justices served at the same time and would do much to salve the wounds left by the appointment of conservative justice Clarence Thomas to replace civil rights legend Thurgood Marshall. 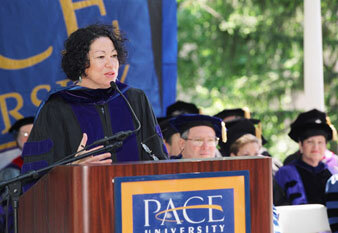 Critics may point out that Judge Sotomayor and Governor Patrick are products of the Ivy League. Although greater diversity in educational pedigrees (perhaps even a public law school education!) would be desirable on the Supreme Court, two excellent candidates should not be disqualified because they overcame great socioeconomic and other disadvantage to excel in private universities and obtain the credentials that made their rise to national prominence possible. Both simply have too much to offer the Supreme Court–and the nation. (Chief Justice Earl Warren Professor of Constitutional Law, NYU School of Law): Academics like to break new ground, so I am abashed to admit that my pick for Justice Souter’s replacement is the apparent front-runner, Judge Sonia Sotomayor of the Second Circuit of the US Court of Appeals. My remaining claim to originality is that my choice is not dictated by the conventional reasons adduced in her favor, weighty as those reasons are. I support Judge Sotomayor because she powerfully embodies the rule of law at a time in our nation’s history when faith in law’s empire needs redemption. Given that Judge Sotomayor has been touted for some time as a potential nominee to the High Court, the paucity of discussion about her written opinions is surprising. When these opinions are reviewed, one quality that emerges is her profound respect for the divide between law and politics. Perhaps in part because of her experience as a district court judge before her elevation to the appellate bench, Judge Sotomayor’s appellate opinions are unusually alert to governing precedents emanating from the circuit or the Supreme Court. She is a judge’s judge, who has something of Justice Souter’s romance with the law. For this reason alone, she would be a great successor to a great justice.